Interactive Light Installation with 480 LED Light Panels 53 x 16 x 13 ft (length x width x height) GeNeSiS consists of 480 LED light panels suspended in three layers. 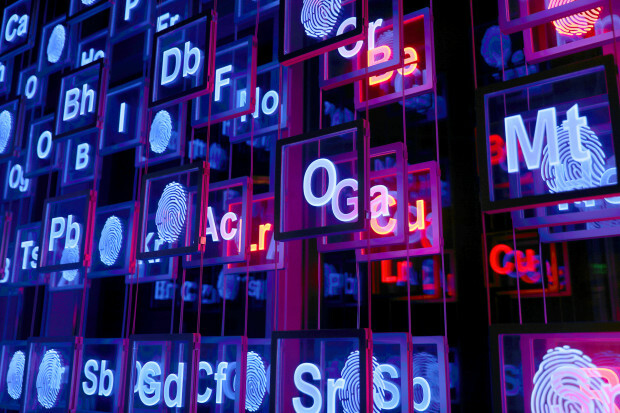 It uses the symbols of the periodic table as building blocks for interactive poetry. Users can submit their poetry through the project web-site. A committee reviews the submitted poems and selects the poems that will be displayed in the installation. The title “GeNeSiS” was chosen from a list of common words that can be formed from symbols of the periodic table. 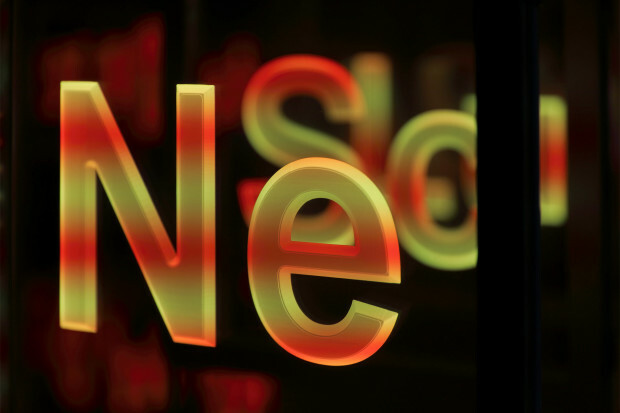 The symbols used represent germanium, neon, silicon and sulfur. Users can submit their poetry through the project web-site. The words will be vetted against a dictionary of offensive language. After this initial cross-check, an algorithm evaluates if the words can be built using the symbols of the periodic table. If the words of the poem can be created only using the symbols of the periodic table, the poem will be submitted to the curatorial committee. If a word or words cannot be created, the user is asked to change their input. The committee will review the submitted poems on a regular basis and select the poems that will be displayed in the installation. 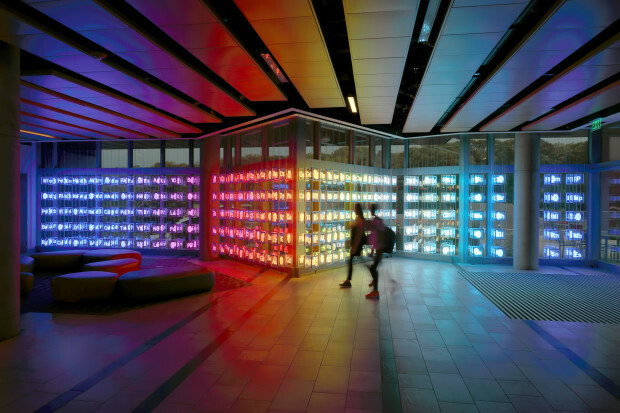 The installation is conceived both as a complete aesthetic infrastructure, as well as an open interactive artwork. Several slow motion color sequences are pre-programmed and randomly interspersed with poetry submitted by the viewers. In the micro mode, the symbols light up sequentially in the order they are used within the word, e.g. “Ge”, “Ne”, “Si”, and “S” illuminate one after the other if the word genesis is displayed. 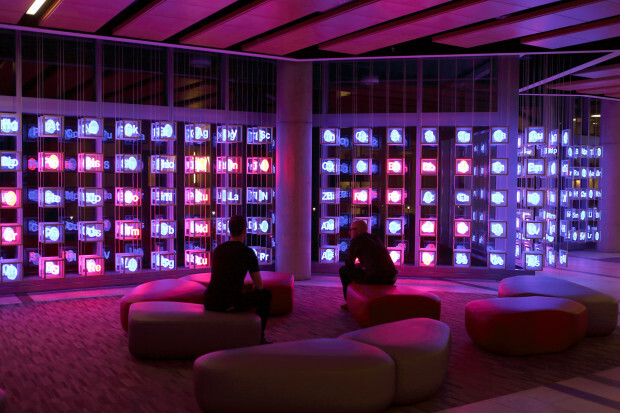 In the macro mode, the word scrolls horizontally across the entire light panel grid of the installation. 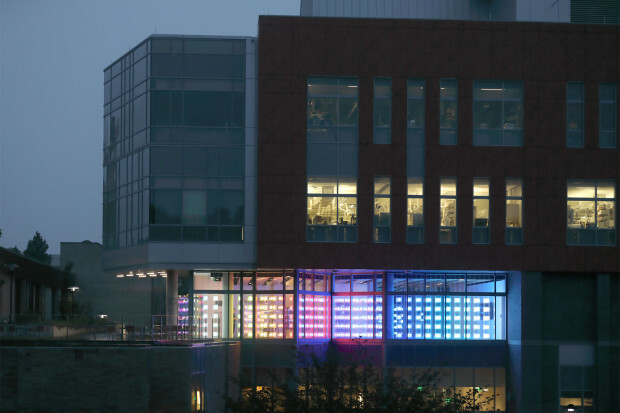 Collaborations occurred on many levels during the 1-year design, production, and installation process. From the Center for Chemical and Forensic Sciences’ IT team, the programmers of Agile Oasis Technologies, my electronic engineer Leo Fernekes, and a tightly controlled production as well as on-site installation process lead by the technicians of my production company Paramedia LLC – every team member’s contribution was necessary to complete this extremely successful public art project. I am extremely grateful to Elizabeth Keithline the Percent for Art Director of the Rhode Island State Council on the Arts for her courageous leadership role and advocacy for this exceptionally complex project. The installation was awarded through an open competition in 2014. 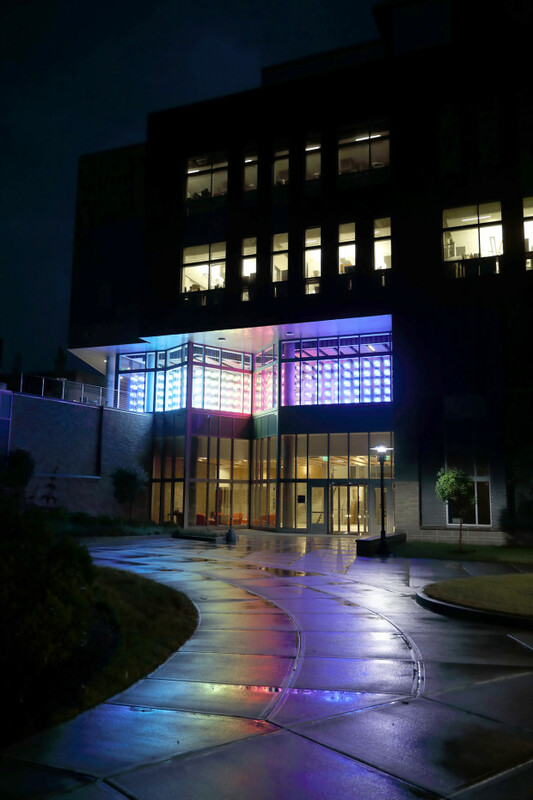 The artwork was commissioned by the University of Rhode Island URI and the Rhode Island State Council on the Arts RISCA. The architect of the building is Wilson Architects of Boston, MA.